When looking to buy helmets, I consider a number of crucial factors ranging from safety to performance and affordability to user-friendly features to the visual appeal of the product. Another thing is checking forums and opinions – this is why I decided to write this Bell Vortex Helmet review.Going through a large number of available helmets online, initially I chose the ones that held the highest appeal for me. The Bell Vortex motorcycle helmet outdid all others in the visual department. I’ve been very impressed with Bell Helmets lately. Several of my friends own Bell too and swear by them. Reading up several of the available customer reviews online, I decided to order one. Upon receiving it, I took the helmet on a long ride and was so impressed upon using it that I decided to write this review. The helmet is extremely stylish and looks great on whoever tries it, if it fits them well. I ordered a black one but it is available in a variety of different styles and designs. Choose whichever suits you best. No other helmet competes with its elegance. The visor’s movement is really smooth; easy to open and close. The helmet is super comfortable because of its removable liner comfort and padding. There is enough space when wearing the helmet to slip in eyeglasses and a pair of thin speakers. I tried the helmet in wet conditions too. Its face shield system is very effective and comes with an anti-fog coating. The face shield can be locked and then lifted easily with a simple mechanism. It also includes one of the most efficient ventilation systems in the market. It is engineered intelligently so you can easily control the air flow through the vents and adjust them to your own needs. But the ventilation led to the helmet in being a bit loud and noisy. I prefer my rides to be more quiet and comfortable but that’s the best we can get in such an affordable price. I have a big head, so I didn’t find the helmet to be heavy but not everyone might agree with that. First off, the helmet is somewhat on the heavy side and weighs just under four pounds. Its shell is made up of a polycarbonate alloy and comes with Velocity Flow Ventilation which is adjustable to control air flow and temperature. To provide you with a very comfortable experience, the helmet includes interior comfort liner, padded wind collar and contour cheek padding. The liner is removable and can be easily washed; plus it is antibacterial. The integrated speaker pockets can be used to make the most out of your bike riding experience. The face shield is easy to maneuver and is fast and smooth. The shield had been coated to make it fog and scratch free and UV resistant. The helmet is DOT and Snell 2010 certified, so you can be sure about its safety and comes with a five year warranty. Many unique features make this Bell Vortex motorcycle helmet my favorite. First would be its elegance and visual appeal and the number of designs you can choose from. There are literally so many good-looking styles, you might feel conflicted. I did too and simply went for a black one. For me, nothing beats black. The helmet is also amazingly affordable. At such a price, it would be hard to find so many exceptional features in a helmet. It’s worth every penny spent, maybe even more. The comfort it provides is simply outstanding, it has to be the most comfortable helmets I have tried. The liner and interior padding works really well – it’s easy to wash as it is removable. The ventilation system is really rather effective. Initially, I thought it would be a hassle to operate that, but it really isn’t. The mechanism is simple. Read the instruction manual carefully, give it a few tries and you can do it in a breeze. You can use it to adjust the air flow and temperature to your liking. I loved that the face shield doesn’t fog or scratch due the protective coating that has been done on it. It makes the helmet more reliable too. In fact, I find the Bell face shields to be among the best in the business. The reason is that the mechanism is super simple, made from very few parts overall but astonishingly effective. You have to feel it for yourself to believe it. The loudness and overall noise level were more than I am comfortable with or prefer. The helmet has a trade-off between the effective ventilation system and the noise levels. But I guess that the best’s that can be managed to keep the helmet within a suitable price range. I compensated for the noise by using ear plugs. That somewhat curbed the loudness. Interested in seeing more bell helmet reviews? Check Out our Bell Qualifier and bell rogue review. The helmet worked fine for me. But it didn’t fit on several of my friends’ heads. They used other helmets of mine of the same size but struggled with this one. So you will have to be careful about which size you order. Going back to the weight, some of you might feel that the helmet is a little too heavy for your head. It’s a personal taste thing. 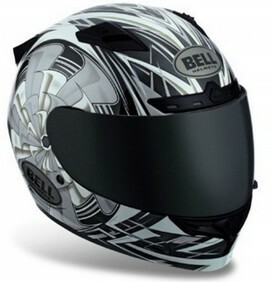 Bell Vortex motorcycle helmet is highly recommended if you want a great looking helmet which is affordable, super-comfortable and has all the user friendly features to enhance your motorcycle riding experience. The helmet is exactly what it promises to be. Like me, you will be extremely satisfied with it. Just make sure you order the right size and use ear plugs if you find the loudness to be a discomfort.